3CX Preview Dialer is a web-based "preview" dialer for 3CX. With 3CX Preview Dialer, your agents make "high-touch" outbound calls to your contacts. 3CX Preview Dialer helps you manage campaigns, assign agents to phone lists within a campaign, read from survey scripts, record notes in a centralized database, and run web-based performance reports. We created 3CX Preview Dialer to help call centers manage surveys and other campaigns. It has helped countless customers in the past and we know that it will satisfy you as well! With 3CX Preview Dialer you can dial customers with more accuracy and get better reactions from them. 3CX Preview Dialer will read custom made script to your clients after calls are made. Managing and customizing the script is easy with our simple web based system. With 3CX Preview Dialer, you can save recordings of customers' surveys. This allows you to analyze and results and make reports. Track how the service of each of your customers is going with our built-in mini CRM. 3CX Preview Dialer Integrates with 3CX PBX for Windows making it easier to use than ever before! Run web based performance reports based on survey reports. This will allow for simply made yet powerful analytics and statistics! 3CX Preview Dialer helps you manage campaigns, assign agents to phone lists within a campaign and read from survey scripts. Streamline your company their 3CX Preview Dialer. Campaigns, surveys and employee scripts will all become easier to run. All for the same low price, you can all the great features of 3CX Preview Dialer and many other features. It's an unbelievable bargain! 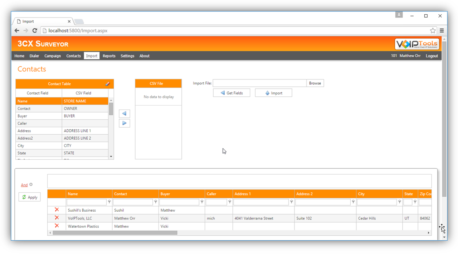 3CX Preview Dialer is a web-based “preview” dialer for 3CX. With 3CX Preview Dialer your agents make “high-touch” outbound calls to your contacts. 3CX Preview Dialer helps you manage campaigns, assign agents to phone lists within a campaign, read from survey scripts, record notes in a centralized database, and run web based performance reports. 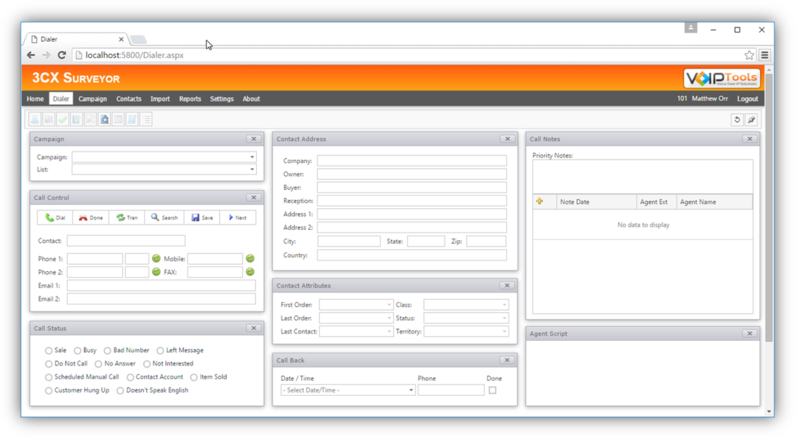 3CX Preview Dialer is designed to integrate with the popular 3CX PBX for Windows. No propriatary hardware is needed for this solution. Agents can leverage 3CX Preview Dialer web interface, and a free 3CX softphone, to work from home or the office.